Argan trees grow and survive in semi-desert areas of the Mediterranean which grows almost exclusively in Morocco. 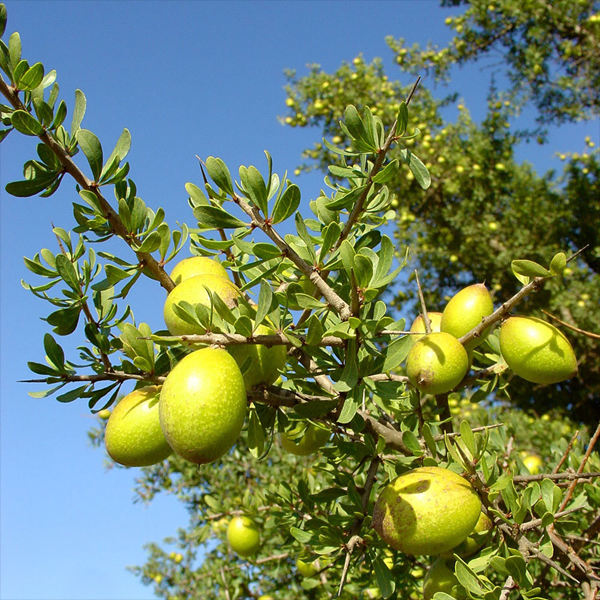 The deep roots and small leaves of the argan tree allow it to resist arid winds and water loss, resulting in a nut with a unique oil profile. Pure argan oil is a rare and precious oil that is harvested and extracted from the nut of the argan tree. This is a pure natural therapeutic quality carrier oil from Morocco. 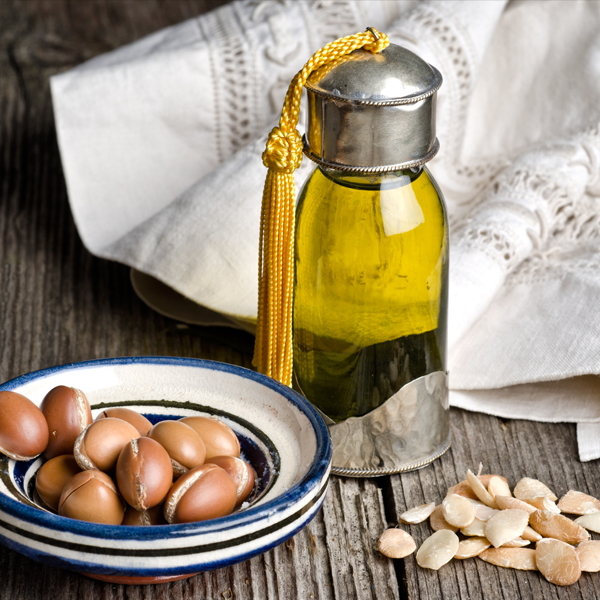 Argan oil is most commonly used as a skin moisturiser to hydrate and soften skin. With its high vitamin E and fatty acid content, argan oil is the ideal product to give skin a natural boost. It absorbs easily and is non-greasy and non-irritating, which makes it a great natural moisturiser. Argan oil is great for hair. Its natural properties are a tremendous boon for a scalp plagued by dandruff and irritation. Argan oil is rich in natural phenols that are beneficial to hair follicles. Not only does it promote new hair growth, but also will help you grow healthy, thick looking hair. Face moisturizer - After cleansing morning and/or night, massage a few drops of pure argan oil directly onto your face and neck. Since it is considered a dry oil, it absorbs quickly and is not greasy. If you want to use it as a serum, apply your night cream after the oil absorbs into the skin. Hydrating toner - Add a few drops of argan oil to your favourite facial toner to hydrate and tone simultaneously. You can make your own toner by adding a few drops of argan oil to Rose or Orange Blossom water. Rejuvenating & brightening face mask - Add a few drops of argan oil as a special ingredient to your store-bought mask. Alternatively, make your own mask by mixing 1 tablespoon of lemon juice, 3 teaspoons of Greek-style yoghurt, 1 tablespoon of honey and 3 drops of argan oil in a bowl. Apply on a clean, dry face and leave on for 10 minutes. Rinse off with warm water. Exfoliating lip scrub and moisturiser - To smooth and moisturise your lips, add a few drops of argan oil and vanilla extract to fine brown sugar for a healing moisturiser. Lightly massage into lips using circular motion and rinse off. Face glow - Add a drop or two of argan oil to your foundation, bronzer or tinted moisturiser for a dewy, luminous glow. Leave-on conditioner - After the shower, while your hair is still wet, add a few drops of argan oil to your hair, ends and scalp to condition, hydrate and moisturise. It’s especially nourishing if your hair is dry from daily use of a blow dryer, straight-iron or curling iron. Hair styling shine - When your hair is dry, use as a styling product by adding a few drops of argan oil to the palms of your hand. Rub your hands together and run your fingers through your hair to create shine and tame frizz. You only need a small amount. It lasts a long time. Overnight hair treatment - Massage a generous amount of argan oil into your hair, ends and scalp. Wrap your hair and leave it on while you sleep. In the morning, wash your hair and you’ll have luminous, soft locks. Cuticle and heel softener - Massage a few drops of argan oil into your cuticles to soften, moisturise and encourage nail growth. Use as an overnight treatment to nourish cracked heels by working a good amount into your feet and toes. Cover with socks and wake up to supple feet. Body and bath oil - Add a few drops of argan oil directly onto your skin, into the bath or body lotion. It’s safe to use on a baby and to help reduce stretch marks on a pregnant belly too. Carrier oils are a massively important feature of an aromatherapy treatment. The correct and thoughtful use of carrier oils (also known as base oils, or vegetable oils) in therapeutic massage adds a huge additional dimension to the benefit of the treatment. Despite this, carrier oils in aromatherapy are sometimes seen simply as the vehicle for the essential oils to be introduced onto the skin. Hence the use of the word 'carrier oil'. Why are Carrier Oils Important? Vegetable oils are largely composed of fatty acids, which are very important to the body, not only because they are an important source of energy, but also because they are a component in the building and maintenance of healthy cells. Many vegetable oils contain essential fatty acids (EFAs). These cannot be produced by the body yet they are a requirement for life and health. Deficiency of EFAs can lead to a number of ailments, including dry and flaky skin, and raised cholesterol. Create your own Carrier Oil Blends Different oils can be suitable for different skin types. Try creating your own vegetable oil blends. For example with wheatgerm, sunflower, sesame and hazelnut; or add 10% of avocado oil to sweet almond to create a carrier oil for dry skin. This is a pure natural therapeutic quality carrier oil from Morocco. Many carrier oils have significant benefit for maintaining a healthy and youthful skin. 100% Argan Oil, organic unroasted.